Lol, St. Ronald Knox had a great sense of humor, the crack about Montgomery smiting Rommel in the hinder parts hahah. 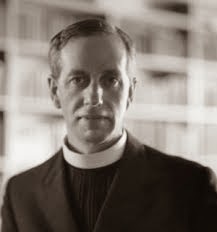 St. Ronald Knox, pray for us and pray for the Catholic Biblical Association, the United States Conference of Catholic Bishops and the Confraternity of Christian Doctrine. Please pray these three organizations work together to give us a faithful and wonderful new English Bible translation in the 2025 New American Bible! One thing I find interesting is how the modern biblical translator has completely abandoned the thought behind the dynamic equivalence translation that seemed triumphant between 1940 and 1980. That was the era of the Knox, the New English Bible, and the Jerusalem Bible, and the Grail Psalms, all of them celebrated as literary translations of the scriptures. Since then, and not just in bible translation, the entire faith in dynamic equivalency has been abandoned! The celebrated Pevear and Volokhonsky (spelling?) translation of the Russian greats of the 19th century has gained a reputation for being way more literal than their peers. I've seen similar efforts in translating the Divine Comedy and others. Meanwhile, almost every single Dynamic Equivalence translation has been phased out and been replaced by something more literal. The original NAB to the '86 NAB to the NABRE, the JB to the NJB, the NEB to the REB, the Grail to the Revised Grail etc, etc. Does this have anything to do with the optimism of the Council and the ecumenical spirit of the mid 20th century curdling? Or us entering a post literate society, where "good English" is mistrusted as our language grows simpler, and simpler? This is a NABRE fan writing this, but still I wonder. And yes, Fr. Knox pray for us! It is true that the great dynamic translations have become more literal, but it is also true that the great literal translations are becoming more dynamic. This makes sense, as translations are revised, the translators want to fix what they see as the errors or excesses of the previous version, so dynamic translators want to make the revision a little less dynamic, and literal translations want to make the revision a little less literal. I tried to read "On Englishing the Bible", but confess I couldn't finish. The reason being was Knox's narrow definition about what true English is. It is a language this is always evolving and borrowing words and expressions. If there are "Hebraisms which we do not notice, because we have allowed ourselves to grow accustomed to them", then they have become incorporated into the language and have become part of the tapestry that is English.